Experience the history and witness the skill and craft that has gone into Donegal Tweed for generations. Nestled in the picturesque town of Ardara, Co. Donegal on the Wild Atlantic Way you will find the hidden gem that is Triona Donegal Tweed Visitor Centre. The building that houses Triona Donegal Tweed Visitor Centre is known locally as the 'Mart' and once housed over 60 weavers from the local area. Dennis Mulhern himself was one of these Weavers and worked in the Mart after leaving school at the age of 14. Dennis is a fifth-generation hand weaver and his love of the craft saw him start a small bespoke Donegal Tweed company from his own home which he called Triona. The 80's gave Dennis the opportunity to purchase the 'Old Mart' and the heart of Donegal Tweed came to life once again. In 1992, Bord Fáilte Ireland approved Triona Donegal Tweed Centre and the Mulhern Family now welcome visitors from all over the world to the center in the picturesque village of Ardara. The entire Mulhern family have dedicated their lives to protecting and nurturing the skill, craft and heritage of the traditional Donegal Tweed. A warm Irish Welcome awaits you as you are treated to a Guided Tour of the Centre and witness our Master Weavers at work on traditional Looms that have been used for centuries. In 2017 Dennis's dream of recreating his family homestead was realised with the introduction of 'The Weavers Cottage' to the centre. The cottage is an exact replica of the home in which Dennis grew up, complete with Thatched Roof and the Loom House at the side. 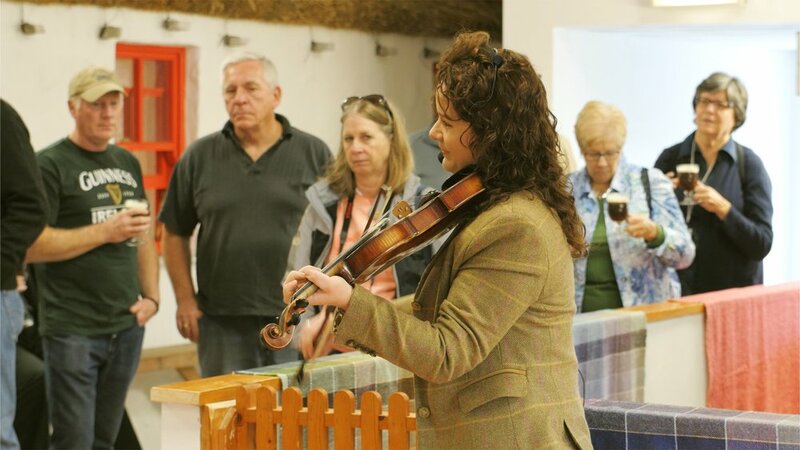 You will be guided through the history of how people in rural Ireland lived in these days and hear details of how all the family where involved in age old traditions such as knitting, spinning and hand weaving. During your visit you will enjoy our Audio-Visual Display which transports you back in time to witness the history and heritage of Donegal Tweed in Ardara 'From Fleece to Fashion'. Triona offers an array of quality tweed products made from the finest locally sourced 100% lambswool. All our cloths are inspired by the colors of the ever changing Donegal landscape with our Signature Purple Tweed Cape being inspired by the wild heather. We combine the tradition of our Donegal Tweed with contemporary design to deliver stylish, quality Tweed Capes, Tweed Jackets and Tweed Coats and a selection of Men's Tweed Jackets and Tweed Accessories . Our Tax Free Shopping also offers a large selection of Irish Sweaters including Aran Woollen Mills, West End Knitwear, and Fisherman out of Ireland which is also made here in Donegal. Nothing compares to a special piece of Jewelry as a reminder of your visit to Ireland or to celebrate your Irish Roots. With this in mind we have a unique selection of Hand-Crafted Irish Jewelry exclusive to Triona, available in store. Your Heart will remain in Donegal but your memories will never fade.